In less than three hours we leave New York City. We feel confident in saying that we did as much as any humans could possibly do in one year in this city. We're very sleep deprived right now so we'll hold off on writing about what made us fall in love with New York City this year for another post after we've caught up on some sleep and rest. We had the best time of our lives. This is not our final post (we have dozens and dozens of food and miscellaneous photos to share) so please continue to check in the next few months. We started off the day by turning in the keys to our apartment, a walk around our neighborhood and a stop at Chelsea Market, then our usual Sunday brunch. We spent the remainder of our day at Central Park, of course. As we were making our way out of the park, we saw a group of 50 to 60-something-year-old dancing machines grooving away to techno music. Some of them were dancing on their roller blades. Most of them seemed like they were ex-Soul Train dancers or Studio 54 regulars back in their day and they were showing off their moves. It was a fun way to end the day. We told you we're feeling sentimental, so of course we have to listen to one of the best New York songs Arthur's Theme by Christopher Cross. Filmore Place, Williamsburg, Brooklyn. Our first (temporary) New York apartment. This is where we lived out of a suitcase for about a month. It was such a nice apartment with brick walls, fireplace, two bedrooms, lots of windows and light. But it kind of ruined us during our apartment hunting period since it was all downhill from there. We'll miss turning on our radio and listening to our favorite radio station, NPR. We listened to NPR as we got ready in the morning, with our morning cup of coffee, with our afternoon wine, and pretty much every time we were home. Some of our favorite shows included Weekend Edition with Scott Simon, Studio 360 with Kurt Anderson, The Brian Lehrer Show, Morning Edition with Steve Inskeep and Renee Montagne, music with Jonathan Schwartz, All Things Considered, and last but not least Car Talk with brothers Tom and Ray Maliozzi. We loved how the Car Talk brothers cracked themselves up and we, in turn, would crack up. It won't be quite the same hearing it online. Another radio station on regular rotation has been 98.7 Kiss fm. We could do without some of the crappy R&B songs they play on heavy rotation, but we loved the mix of their old school songs that most other radio stations don't play. Thanks to Kiss fm, Saturdays from 7 to 9 pm was always fun time at our apartment. A female child standing next to her mom says to another female child in her stroller (yes, a stroller), "I'll have my mom call your mom and we'll get something set up for a play date." And she said it like a sassy business woman. She'll probably get an iPhone when she turns six. 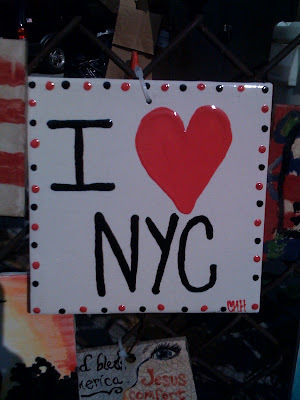 Tomorrow will be our last full day in New York City, so we're feeling a bit (lie, a lot) sentimental and weepy. New York nostalgia in the next few posts, starting with our New York books. I bought this Rough Guide to New York City years before we moved here. Despite some of the material being dated (like the Fulton Fish Market no longer existing), this book was still very helpful. We were also able to check off almost everything on their top to do list. No Reservations has been one of our favorite television shows. We love Anthony Bourdain's dry sense of humor, sarcasm, and his love for food and all things meat. Before we knew we'd be moving to New York, we wanted so badly to visit Kebab Cafe in Astoria, Queens. But after we moved here, we heard what kind of crook the owner was and decided to pass. Too bad we didn't run into Bourdain on the street or at a restaurant, but we were able to try some of the restaurants he mentioned on his show and in his books, like Manganaro's, Prune, and Di Farra. We're looking forward to seeing the New York Outer Boroughs episode on September 7th, which includes his visit to Xi'an Famous Foods. We bought this New York photo book published in 1977 at Housing Works, one of our favorite Chelsea thrift stores. What's great about this book is photos like this. We loved this polaroid photo of the iconic photo being taken on August 1974. A walk through their (and our) favorite park, Central Park. Last but not least, a book we bought soon after we moved here. It's one of our favorite essays on New York, Here is New York by E.B. White. This deserves its own post. Last week we went for a ride on the Clipper City for a sunset sail across the New York Harbor. Departures take place at Pier 17 at South Street Seaport. The Clipper City is one of America's largest sailing boats still in commercial operation at 160 feet long, with masts rising 135 feet off the deck. It's a faithful replica of the clipper ships that sailed a century ago, rebuilt from the original plans borrowed from the National Archives. This is the view from the boat near the pier. We were docked for 30 minutes too long and we were getting antsy that we were going to miss the sunset. Finally, we started moving along but the sky's colors were rapidly changing. The moment we were waiting for. Everyone on the ship was silent at this point. Majestically stunning. It was beautiful when the plane flew right above the final moments of the setting sun. And just when we thought we couldn't see anything more beautiful than what we had just witnessed, we see the Statue of Liberty in the distance, and that faint view was simply poetic. The always powerful symbol, Ellis Island. This photo of the Statue of Liberty was our favorite photo we took that night. It was the most proper way to say goodbye since we last visited her almost a year ago. There was also a bar on our boat. Unfortunately, there was a group of obnoxiously loud and drunk females that apparently mistook this for a booze cruise. It's a shame when people would rather get stupid drunk than take in the beautiful sights with sober eyes. If you're ever in New York during the warm months, you absolutely have to take a boat ride. There's tons of other boat options that also depart from Pier 17, like the Circle Line Cruise, smaller (more expensive) sail boats, fancier large boats with dinner and music options, and the Shearwater. A short video clip of our return to the pier. The pier area is a bit of a tourist trap so we skipped the unappetizing looking restaurants and touristy shops and headed toward our subway stop. But en route, we saw this and had to stop. We knew there was an L&L in New York but we had no interest in searching for the place. But since we had stumbled upon it, we decided to go in to taste a New York chicken katsu. "The REAL Hawaiian Mac Salad." The biggest difference we saw when we walked in was there's a sushi counter at L&L here. People in Hawaii would be so confused if they walked into L&L and saw a sushi chef. The other difference was that this New York L&L didn't have that horrible old oil smell that's prevalent at almost every L&L, especially the L&L in downtown Honolulu. There were things like a surfboard, spam musubi photos, and Honolulu Star Bulletin articles on the walls. But this just made us crack up. The first person I naturally thought of when I saw these was Marie. She would have been so mortified standing next to me as I poorly attempted to pronounce the words. Luckily, no one in New York cares. And here it is. It's been ages since we had a chicken katsu plate with three scoops of white rice. It tasted slightly different from what we remember the chicken Katsu in Hawaii to taste like but it was still good. Main difference - this plate cost us $10.